So far, this species is known only from one site in Britain (Felton 1997), although it is widespread in the cooler parts of Europe and Asia. In north-western and central Europe it has been recorded from Belgium, Sweden, Germany, Switzerland, Austria, the Czech Republic and Poland. Gnaphosa nigerrima is much like G. lugubris in general appearance. It is a characteristic wet peatland species, unlike lugubris which inhabits drier habitats, particularly heathland. It was first recorded in 1994, when it was collected in pitfalls set in Sphagnum moss, a habitat similar to that preferred by G. leporina. The species is characteristic of active Sphagnum mosses in middle and north-west Europe. Adults were collected between 16 June and 8 September and were restricted to the Sphagnum lawn (Felton, 1997). Over the years, this particular boggy area had been well worked by local arachnologists and it is curious that a conspicuous species of this size had not been collected earlier. The species appears to be restricted in Britain to Wybunbury Moss, where it was taken in 1994 during a survey for Carorita limnaea. Felton (1997) reports that no specimens were located during a search of museum or personal collections, nor were any collected during Carorita limnaea surveys at ten other schwingmoor sites in the west Midlands and north-east Wales or by an intensive pitfall programme at Chartley Moss (Procter, 1988), structurally the most similar site to Wybunbury Moss. 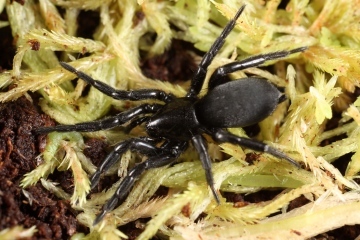 Most of these sites, such as Abbots Moss, Cheshire, have been thoroughly worked by arachnologists, so it is unlikely that such a large spider as G. nigerrima would have been missed. On the other hand Felton also states that the spider was initially thought to be Gnaphosa leporina (L. Koch), which was not found during the survey, until closer examination indicated specimens were clearly different from the known British species. There is an earlier record of G. leporina from Wybunbury Moss, suggesting that it might have been previously overlooked as that species. Wybunbury Moss has suffered from attempts to drain the site for development and this has caused drying out of the peat. English Nature (now Natural England) and volunteers have been involved with maintaining the moss since the 1980's. However the population appears to be small and must be vulnerable to stochastic events within a short time period. Wybunbury Moss is a National Nature Reserve owned and managed by Natural England. It is an internationally important and unique example of schwingmoor (floating bog) consisting of a raft of peat, floating on a lake 13 metres deep.